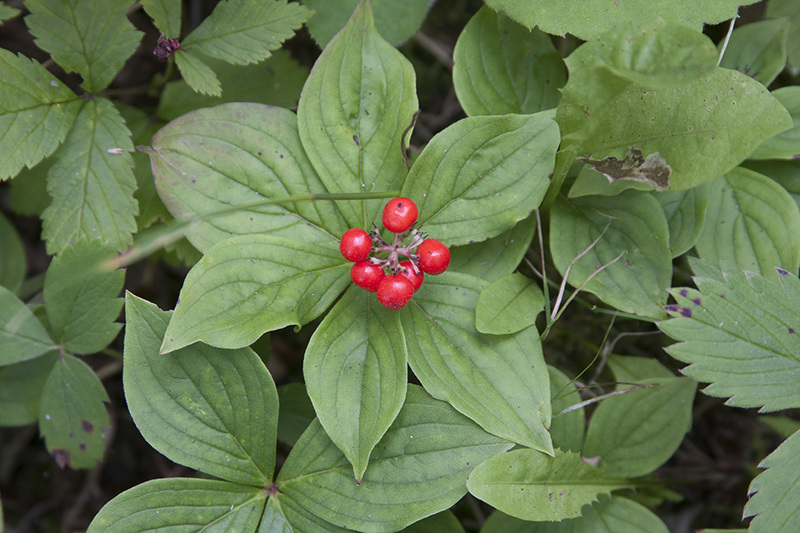 This is a 4″ to 8″ tall, erect, perennial, herbaceous shrub that rises from a creeping, slender, woody rhizome. It often forms colonies. The stems are erect, slender, unbranched, and hairless. 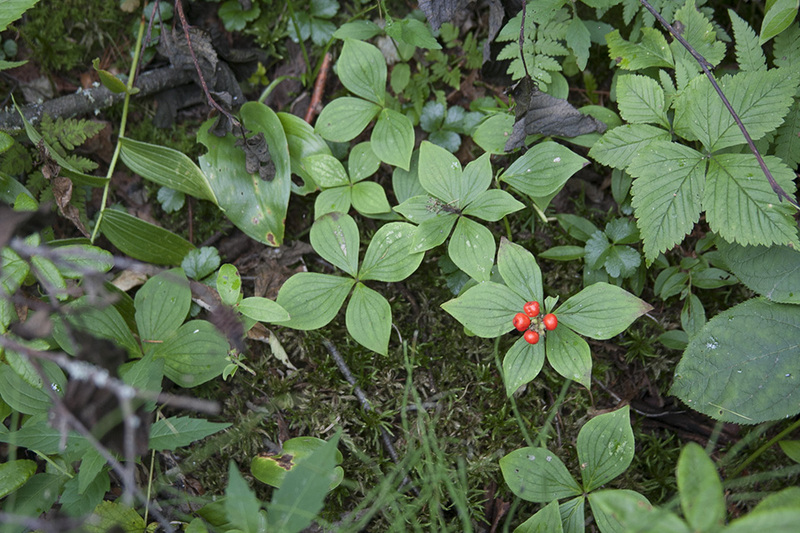 There are 2 or 3 pairs of opposite leaves at the top, and 1 or 2 pairs of tiny, vestigial, scale-like leaves lower on the stem. The space between the nodes of the leaves at the top is short, causing the leaves to appear as a whorl of 4 or 6 at the end of the stem. 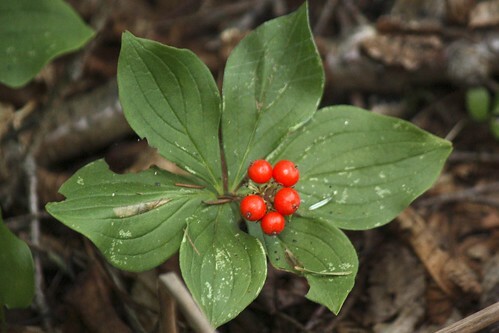 The leaves are 1½″ to 3″ long, on short, 1 ⁄16″ to ⅛″ long leaf stalks. The leaf blade is papery, inversely egg-shaped, with the attachment at the narrow end, or diamond-shaped. They taper to a point at the tip and taper at the base to the leaf stalk. They have 2 or 3 pairs of conspicuous lateral veins arising from the midvein in the lower third of the leaf and curving into an arch. The upper surface is dark green and shiny. The lower surface is paler green. The margins are untoothed. The leaves turn red in the fall. The inflorescence is a solitary, compact cluster of many small flowers rising on a ⅜″ to 1⅛″ long stalk at the end of the stem. Below the cluster are 4 white to purplish, petal-like bracts, giving the overall appearance of a single, terminal, ¾″ to 1½″ wide flower. The individual flowers are about 1 ⁄16″ wide. 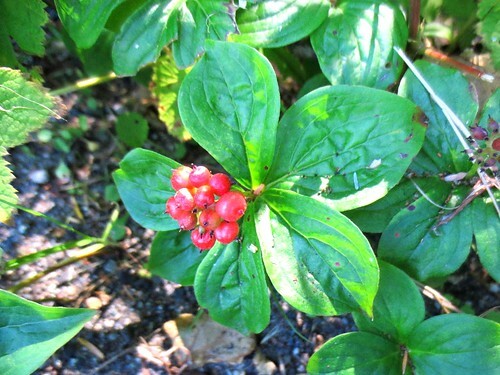 The fruit is a bright red, globular drupe, 3 ⁄16″ to ¼″ in diameter, borne in a dense cluster. 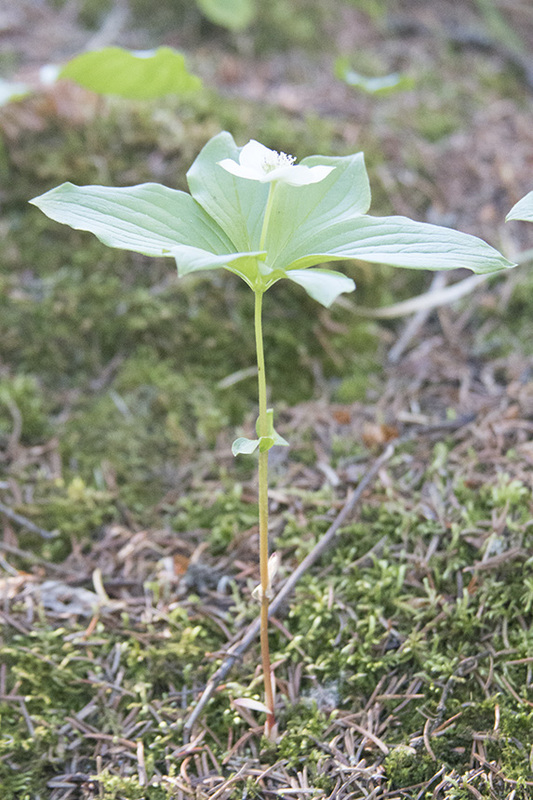 A plant without a persistent, above-ground, woody stem, with the leaves and stems dying back to the ground at the end of the growing season. An organ or part that is much reduced in size, imperfectly formed, and nonfunctional, that may have been larger, perfectly formed, and functional at one time. 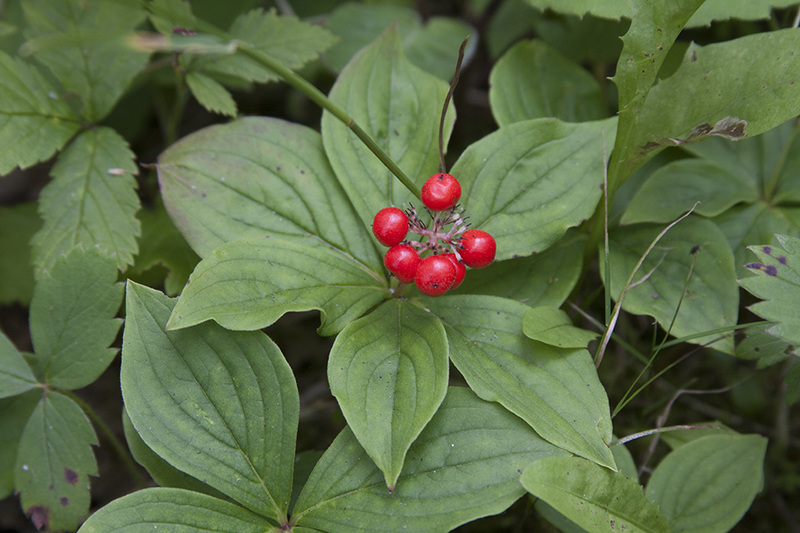 Bunchberry , Ground Dogwood , Dwarf Dogwood , a low ground-cover plant with small flowers enclosed within four petal-like bracts. 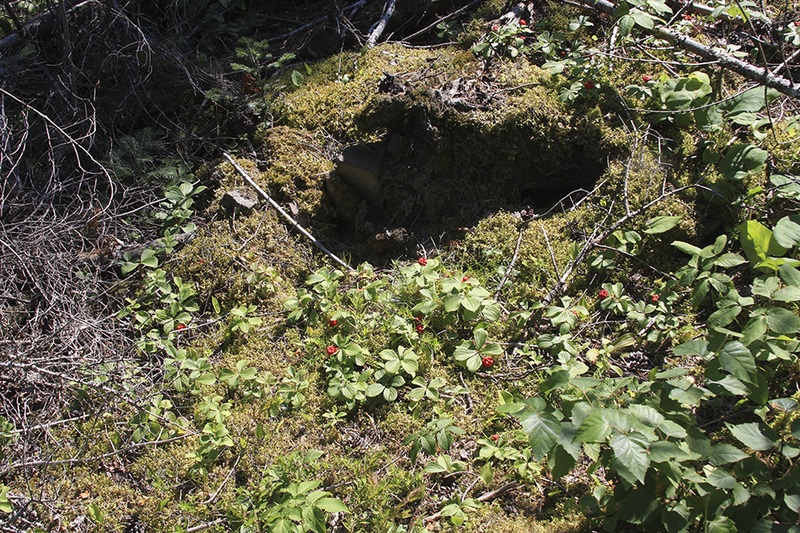 The bright red cluster of berries are sweet though pulpy. 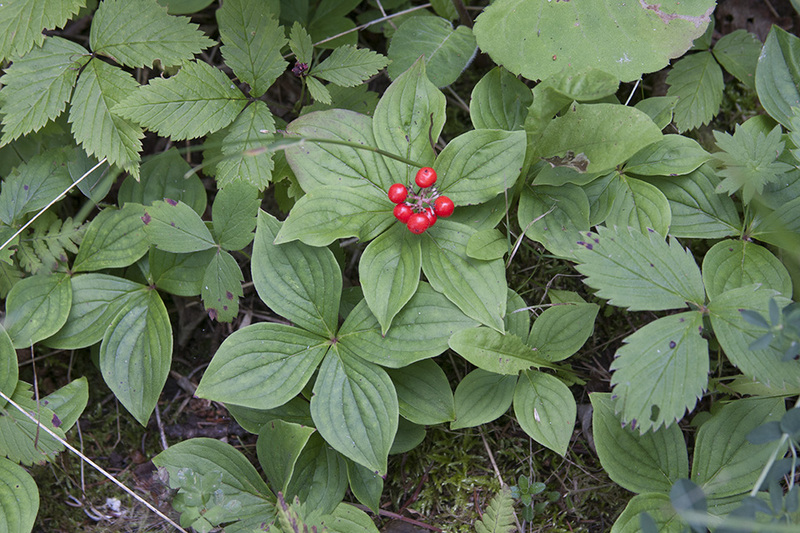 Found in moist, coniferous forests in the Pacific Northwest. 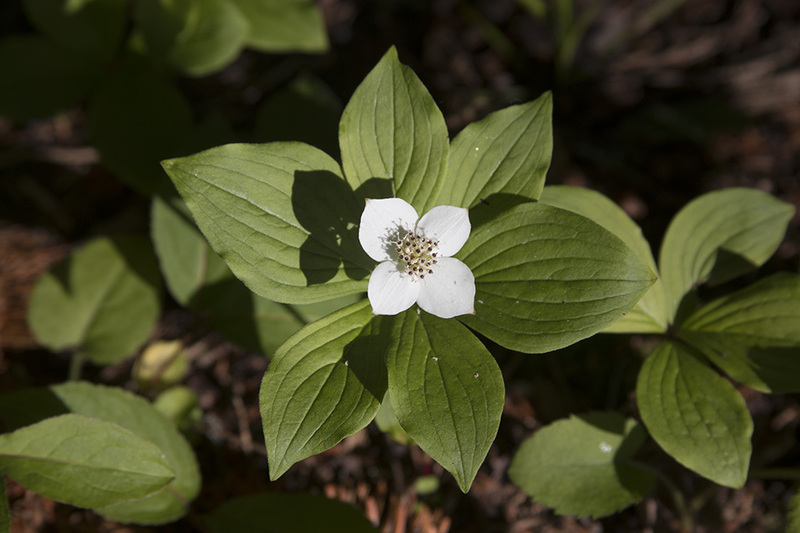 DEL Imaging Systems video of a bunchberry, a type of Dogwood, pollen explosion. the world's fastest plant, taken with an IDT Redlake high-speed video camera system at 10,000 FPS (frames per second).